Romania has transposed the Council Directive (EU) 2016/881 of 25 May 2016 amending Directive 2011/16 / EU as regards compulsory automatic exchange of information in the field of taxation. We will detail below how this directive was transposed into Romanian legislation. What are the most important provisions? 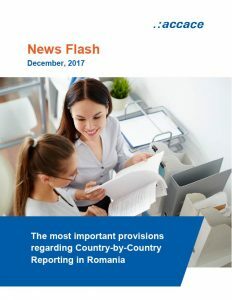 According to the Romanian legislation, the reporting entity of a multinational enterprise group with fiscal domicile in Romania (ultimate parent, surrogate parent company or other company) needs to file a countryby-country report for each reporting fiscal year. The “Country-by-Country Report” form is filed starting with the fiscal year 2016. The deadline for submission is 12 months from the last day of the reporting fiscal year of the multinational enterprise group (e.g. for the fiscal year 2016, the last day is 31.12.2016, and the deadline for submitting the report is 31.12.2017). Each constituent entity of the multinational enterprise group with fiscal domicile in Romania has the obligation to notify the competent fiscal body about its quality within the group, namely the identity and tax residence of the reporting entity, no later than the last day of the group’s fiscal year, but no later than the deadline for submission of the annual corporate income tax declaration for the previous year (25 of the third month of the next year following the end of the fiscal year). Let’s talk about how we can work together in Romania!